It wasn’t supposed to begin with. It wasn’t supposed to begin this way. It was supposed to be a momentous occasion when the boy who wasn’t supposed to make it to his first birthday made it to his first day of kindergarten. When I was a kid not everyone attended pre-school or a pre-k program. Kindergarten was the first day of school. THE FIRST DAY OF SCHOOL. For everyone. This boy of mine who was so early for the day of his birth and so very “late” for so many things after that (first steps, first tooth, heck his first poop was after 43 days) was going to be on time for one major thing in his life. To do something at five and half years old that every other five-and-a-half-year old was doing. The first day of kindergarten. At five years old with all of the other 5 year olds. On the same day as everyone else. Now he’ll have to start school a week late. They robbed us of that milestone. It began, as so many of these things do, with a phone call. 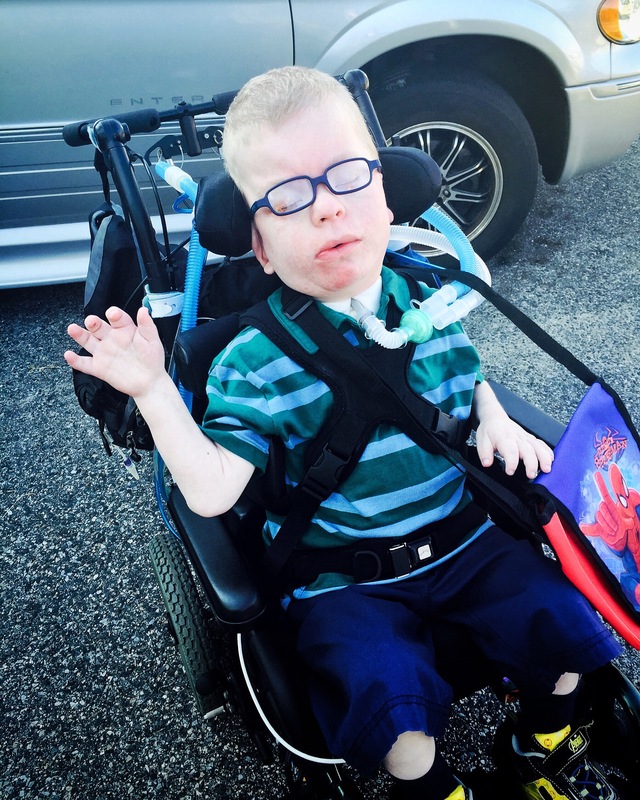 A call from the principal last week to let us know that the lift that was being installed to bring Liam’s wheelchair up and down the short stairway to the gymnasium and music room wasn’t going to be ready for the first day of school. Liam would still have access to those rooms but would have to leave the building and re-enter through another door to get there until the lift installation was completed. She explained that she understood how this was not ideal and that it was a priority to be fixed and that making Liam go outside was unacceptable. She also told Karin ‘come to my office next week on orientation day and I’ll show you his classroom and the lift and the doors he’ll have to use to go in and out.’. Remember that last bit. It’ll come into play later. So yeah, it’s a huge pain and it isn’t fair to Liam to ask him to go outside to get to his classes when it rains, or it gets cold (it is New England) but let’s face it, we are going to have to work with these people for years and years, and throwing a fit about it doesn’t do us any favors yet. So we remained calm and decided that we would set our own personal deadline for them and that if we didn’t see any progress two weeks into the school year we would pursue the matter further. Besides, the fact that the principal called us to talk to us about it two weeks before school even started made us happy that at least they were communicating with us well. Or I guess they were. I didn’t want to begin my son’s first day of school as the angry, demanding parent of the kid who needs some special attention and accommodations. If you start at a ten there’s nowhere to go for when the big problems come up . To build a reputation as a reasonable and understanding parent who understands the challenges that educating a child like Liam can present. By starting the school year with this many big problems they are robbing me the opportunity to build that reputation. We were supposed to be celebrating Liam’s first day of school. This year Kindergarten begins on Wednesday, September 10th; however, on Thursday, September 4th, we will have a “Welcome” meeting at 10:00am, where you and your child will be invited to meet the principal and teachers, visit the kindergarten classrooms, and discuss the expectations of kindergarten for your child. In addition, while there, we require that you schedule a 30 minute appointment so that the teachers can administer a short screening test. Appointments can be scheduled Thursday, September 4th in the afternoon, or anytime (9-3) on Friday, September 5th or Monday, September 8th. There is no school on Tuesday, September 9th. Well that was the last communication we received about the start of school until the phone call today. It’s always the damn phone. This time it was Liam’s teacher. Knowing that in our IEP we discussed a modified schedule (going in late) to start the year she had called to discuss what time Liam would be coming to school. During a frustrating conversation trying to decifer what the best time for the class would be (during a classroom or activity change so as not to disrupt things more than we already are) the teacher and Karin settled on 11:00am. Which was when the teacher then explained that she’d see him in class for his first day of school tomorrow. No, no, no tomorrow is orientation day. Our “Welcome” meeting. The letter is on the fridge. The dates are circled on the calendar. The 10th is the first day of school. I used a vacation day from work for it. We called in favors to get nursing coverage because our nurse needed the 10th off for an important obligation. We were augmenting Liam’s sleep and seizure med schedule to prepare. We scheduled doctors appointments for this week. We were doing everything we could possibly do to make sure that Liam doesn’t miss the first day of school, including planning on bringing him in at the normal time on the 10th and seeing how he did with a full day on his first day. The 10th was the first day of school. Tomorrow is orientation day. And that is how the school department decided to communicate to us that Liam’s class was different from all the other kids. Liam’s class didn’t get any communication. Liam’s class didn’t get to have a’ “Welcome” meeting with their teacher and principal to discuss the expectations of kindergarten for our child’. Liam’s class didn’t get to fully prepare themselves for the first day of school. Instead we got about 20 hours of notice. Karin explained that we have friends whose children are in the same class and also expected to begin school on the 10th, including one particular child who would benefit greatly from seeing his classroom before the start of the school year. The teacher seemed put off not by the news of this huge miscommunication complete and total lack of communication with families that need it most, but by the fact that she was now going to have to call all of the incoming kindergartener’s families to let them know about the change as well. Sure enough our friends got their own call letting them know that their child’s first day of school was not next week but was in fact tomorrow. At Liam’s pre-kindergarten check-up yesterday his pediatrician reminded us of a conversation we had when Liam was only months old about realistic expectations of his life and whether or not he would survive his first year and how remarkable it was that he was about to start kindergarten. None of this changes that. Liam is remarkable. He is remarkable enough that his family deserves to get the communication to adequately provide for his education. I know this BECAUSE EVERY CHILD AND THEIR FAMILY DESERVES THAT! I don’t want Liam to be treated special. I don’t want us to be treated special. I just wanted us to be treated the same as everyone else. To be told what is going on. To have the same chance to discuss expectations that every incoming kindergartener’s family who does not need the services of special education got to enjoy. I’ve called the principal three times since then. Three times since Karin found out that not only are we now not ready for Liam to attend the first day of kindergarten, but that I won’t get to enjoy the celebration of the milestone with him unless we wait and make him miss the first week of school, and that the stress and phone calls of ensuring competent and qualified nursing care was all for nothing, and that we wouldn’t be afforded the chance to see Liam’s classroom before hand. or at least I tried to. the number seems to be for the whole school, which doesn’t really matter since no one ever answered it. I called her once immediately after I found out. The call went straight to voice mail. Realizing that it might still be the end of everyone’s lunch hour I waited an hour to call back.This time, I politely but sternly explained that I find this level of communication unacceptable, I reminded whoever answered that voicemail that less than a week ago the principal told my wife that they would see each other and have time to meet on orientation day giving us no indication that it was actually the first day of classes and that Liam was expected to attend, I explained that I expected a call back. I called the pre-k program Liam attended last year which is in the same school building as Liam’s kindergarten class and asked if they could help me get in touch with the principal and they gave me the same number that I was already calling. I called again an hour and a half later, and left another message asking if we should even attend the orientation. I asked if we were going to be given a oppurtunity to see the classroom and the lift before sending Liam into school. I asked if perhaps the teacher had been mistaken because again, we had just spoken with the principal last week and she gave us no indication of this being the first day of school, and the letter we received from the city explicitly told us this was not the first day of school. I explained that it was very important that I get a return call answering those questions for me. I’m still waiting by my phone. So not only did this entire problem begin with a lack of communication but apparently my child’s school believes that the remedy to the problem they created is to provide even less communication. Maybe I set my expectations too high. I’ve heard so many of my friends who have children with special needs complain about the battles they’ve had to have to advocate for the services and attention that their children need. Based on the amazing job done by the staff of Liam’s pre-K program (IN THE SAME BUILDING AS WHERE HE IS GOING THIS YEAR) I naively thought that wouldn’t be the case for us. “Not in our school!” I used to say to anyone who would listen. “The school department has bent over backwards to try to get Liam the things he needs!” I used to say. I guess I’m the fool. And in one afternoon, I have lost all of my faith in the teacher responsible for my child’s education for the next three years, and the principal who supervises her, that they will communicate, needs, issues, safety concerns to us regarding Liam’s education. They have their work cut out for them trying to earn it back. Miscommunications happen. Maybe the city didn’t mail out the letters they meant to for the few families of incoming kindergarteners in the inclusive special education program. But then to add insult to injury you refuse to return three phone calls about it? Not about some event in a few days or weeks but refuse to return phone calls regarding something as momentous as a first day of school and happening as quickly as less than 16 hours away, and you don’t return the call? A simple phone call back was all I was asking for. To know what was going on with my child’s education. I realize that posting this here may put my relationship with Liam’s educators in jeopardy. I’m ok with that. I use this blog to highlight the wonderful parts of parenting Liam, and believe me it is mostly wonderful, but even if the principal calls back at 8am tomorrow and is all apologies, I will not feel guilty about being angry about today and I will not feel bad about sharing it. Because along with all the fun stories about the zoo and road trips to Jersey A great deal of our time is spent in frustrating beurocratic loops of phone calls and excuses with insurance companies, pharmaceutical companies, medical equipment companies and state agencies. Now I’ll have to add schools to that list. I’ll share it because while I was calling the principal three times today Karin was calling Liam’s durable medical equipment company for about the 6th time about the filters for Liam’s vent that they have on back order that should have been changed out of his vent three weeks ago, and the pulse oximeter probes that are supposed to be changed every week but we haven’t been shipped any new ones in four weeks. That was after she called the state about their problem with the handicapped placard form for Liam’s van and the medical insurance company that denies everything on the first submission (unless it’s something we need a denial letter for so another agency will pick it up THEN of course they drag their feet on denying things). Frustrating situations like this are the pressure for which we need the support. Besides, Liam’s first day of school wasn’t supposed to begin this way. I’ll tell you one thing though, his first day of home schooling will begin exactly as it’s meant to. And at this point, it may just be next month. Like most parents of 5-year-old children we get a lot of arts and crafts projects sent home in Liam’s backpack. Most of them obviously the result of “hand over hand” writing and crafting. That’s ok with us. We came to grips early in Liam’s life that he wasn’t going to be making us any crafts or writing us any letters. We picked Liam up from school about fifteen minutes early on friday so that we could take him to a doctor’s appointment. Liam’s nurse barely had him out of the doorway when he started he shouting at me. “He did such great work today! He worked so hard! Wait until I show you what he did in class today!” Liam’s nurse is not the most excitable gentleman you’re likely to meet and so the enthusiasm was evidence in and of itself of the importance of what we are about to see. I can’t tell you how much class work we end up finding ourselves when going through Liam’s backpack long after his nurse has gone home from the day. Not only did he want to show us this work, he started showing Karin and I this page in the van, before we even had the tie-downs on his wheelchair secure. “That’s when [Liam’s teacher] got really excited and ran to get some more paper. She wanted to see how far she could push him and the only support she gave was to keep her hand at his elbow so his arm would stay on the table and not fall off.” He was speaking faster than usual now “The marker stayed in his hand on his own and he moved his wrist and hand on his own.” That’s when he pulled it out of the bag to show us. From left to right. 1…2…3…4…5. You might not see it. and you know what, I’ll admit that the 4 might be a bit of a stretch but it looks pretty damn good to me. It’s things like this that Karin and I wish we could show to every doctor and resident who saw fit to tell us everything that Liam wouldn’t do. Everything that he’d never accomplish. Everything that’d be impossible for him to learn. Because as a close friend who also is a parent of a child with some special needs often tells us — Everything is possible — the impossible just takes longer. Liam and his best buddy W, the nurse I mention above. The photos are selfies that W has taken and shared with us. It would be a HIPAA violation for him to share them in any other way. But not if I do. On Twitter last night I made fun of myself a bit for being too lazy to post here. I have been writing, I just haven’t been happy enough with anything that I felt I could post it here. With today being my day off I had high hopes that I would get some writing done today and was confident that I would polish something enough to post. I suppose that there’s a chance I still might. But instead, and only because how could I NOT post this, I have to share a photo. Liam has been reluctant to work in his walker lately. In fact on the way home from school today Karin and I realized that Liam hasn’t had a good day in his walker since before the month-long hospital stay last fall. Don’t get me wrong, he’s worked hard all school year but he had so much physical therapy to catch up on that he simply didn’t have the strength. There’s nothing better than having a day off of work on any of Liam’s school days. Then I get to pick him up and participate in his therapies. He may have been holding his Mom’s hand in the picture above, but he was also walking towards something today. I’m thinking that somewhere there may be families out there who outgrow texting each other about poop. We’ll never be one of them. When I got the text I chuckled and moved on to the next thing on my plate at work that afternoon but something started gnawing at me. Something I hadn’t thought of before. A few posts ago I talked about how I had never thought much about Liam making friends. I guess I never thought much about the flipside of that either. Maybe in a general sense of being accepted for who he is but the specifics of social situations that Liam would find himself continue to be hard to imagine. So I called Karin. I wasn’t going to get much more work done if I didn’t. “Do you think the other kids make fun of him when this happens? I mean, what do the other kids say?” I have always loved the fact that Liam is in an integrated classroom along with children of all needs, from “typical”, “normal” kids all the way to, ..well, Liam, and many shades between. At this age especially, it benefits them all. But what are the other kids going to say about the kid who poops in class? This isn’t the first time it’s happened for sure, but the image of Karin having to clean Liam’s wheelchair when he got home jarred loose a fear that it wasn’t the wheelchair, the vent, or even the seizures that would isolate Liam from his classmates, but things like this. Karin assured me that everyone at school loves Liam and it’s happened before so I shouldn’t worry about it at all. She directed the conversation to how good the rest of his day was and I went back to work. Half an hour later Karin called me back. “I was thinking about what you said and so I asked W (Liam’s nurse) about it. Liam and his friend A were holding hands and working on a craft the whole time “it” was happening and even he had no idea why W excused Liam to the nurses station to change him. I don’t think anyone other than W even knew what happened.” She said. I guess my asking got Karin thinking about it too. I don’t think she was ever worried about it like I was, but enough of a thought that she asked W for more details. 9 kids varying from typical to medically complex and 3 of them pooped in class just today?! What the hell am I worrying about? My kid is fitting right in. Liam’s first day of school – Again. Among the benefits to having a child with complex special needs is the fact that he gets to have all sorts of “firsts”. Since he misses out on many of the “normal” firsts, the ones that Liam does get to celebrate, we celebrate to the fullest, and as many times as we can. Yes, we have decided that for some occasions Liam gets to have more than one “first”. He deserves them and so do we. Celebrating so many of the little things is another one of those benefits. Liam’s first day of school was Monday! It’s his third, I think. The first was for therapies. In and out in about an hour. Just Liam and his therapists, his nurse and his mom. It happened in a school so we count it as school but Liam hadn’t yet seen an actual classroom. Months later Liam would spend about a half hour after therapy with the other three-year olds in classroom time with the same teacher he would have this year, but he was really more of a class visitor than a full student then. This year, because of his summertime health issues and the virus he picked up shortly after coming home, we put off sending Liam to his first day of full participation school a few weeks. Therapies alone for a couple of weeks until monday morning when for the first time Karin and I dropped Liam off at school and then actually had to leave him there for half the day. It was not a good feeling. I’ll be honest enough to say that Karin and I bickered and argued the entire time. We’ve left Liam alone with his nurse in our home for a few hours every now and then but we have never dropped him off somewhere only to return without him to a quiet and seemingly empty house. A house that until we get used to this fails to feel like a home without the ever-present breathing sounds of a ventilator. Liam was fine of course. He is accompanied to school with his home care nurse and his therapists there know him well enough now. Like I said he already knew his teacher pictured above greeting Liam for the first time on Monday, so it wasn’t like we just left him with a bunch of strangers for the morning but without any previous experience in leaving Liam, Karin and I are simply not ready for this feeling. We survived, and this morning things got just a little bit easier. Easier because today was new wheelchair day! Something else to celebrate. Instead of picking him up around 12:30 Karin and I were able to take Liam out of class an hour early to have the DME equipment tech fit him into his new wheels. She met us at the school and with the help of a bunch of specialized tools and his PT and OT he is truly riding in comfort now. Next week Liam will not be pulled out early. He will stay for both of his half day sessions. He will, I’m sure, struggle to be awake and alert enough for school that early in the morning. The Olson men are not morning people. Never have been and while we are trying to adjust his bedtime schedule to promote a more awake morning time Liam he is resisting the change with all of his might. On that first day of school the sweet little note from his teacher hilariously read that once Liam woke up an hour after school had started, he was engaged and active from there on out. Only three and a half and already getting notes sent home from his teacher for sleeping in class? That’s my boy! And another first to celebrate. Editor’s Note: The top three pictures were all taken by Karin. She is by far, the better cell-phone photographer. I have to admit I just don’t have the mojo tonight. I’ve been struggling to write a post about how much Liam’s school, and the therapists that he works with there, mean to us but the words just don’t seem to be fitting right. I’ve written plenty of words for sure, but they just aren’t playing well with each other at all. 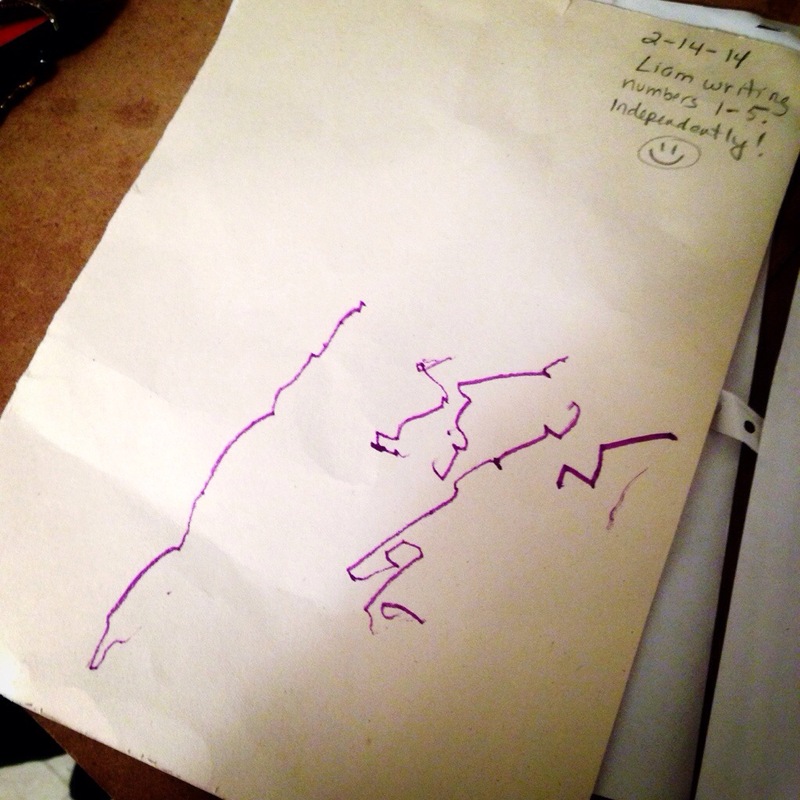 So instead of forcing a bunch of boring writing at you I’ll just show you by pointing you toward this, Liam, at three years old and with the help of those therapists, taking his first steps, and then this, Liam, with the aid of a walker taking his first ever walk with his mom. I’m pretty sure that those two links should give you just a peek into how awesome school has been for Liam. They show it much better than I could write it that’s for sure. Yes today was Liam’s first day of school. It should have been last week but only a few days removed from a nasty virus that came dangerously close to bringing us back to the hospital again Karin and I were unwilling to let him venture into that den of germs for a little while longer. He could have started on monday of this week too but an appointment with his hematologists regarding the blood thinners from my last post was much more important as well and so a week after everyone else’s did, Liam’s summer vacation came to a close. Since he missed most of ESY this year while attending Septic Shock Summer Camp (I don’t recommend it, not much fun at all) we were expecting a serious summer regression of the progress that Liam had made last year. We were pleasantly surprised though when he stayed awake and engaged for the entire therapy session. Just look at the focus on that adorable face up there. He certainly works harder at school than I ever did. Tuckered out after all this work Liam was of course rewarded with a nap and some snuggles from his mom. Not too shabby if you ask me. I wish I had something more poignant to say about school but like I said I just don’t have the mojo tonight. It’s 3am as I type this and since Liam has been sleeping peacefully all night, I’m going to try to get a little reading in before Karin and I switch places at 4. Happy back to school time everybody. I’ll talk to you all again soon. All the news that’s fit to blog. When Liam was born I had a private website through the hospital’s Carepage program to send out posts to approved subscribers (family and friends). It was a wonderful way to send out information without having to make a whole bunch of phone calls and was of course the genesis of what would eventually become PressureSupport.com. I wrote nearly every day about the details of almost every day for a while but eventually the day-to-day waiting game that is the NICU became a slow grind and news would come out more slowly over weeks. We’d get emails and phone calls from family and friends who were sure that the reason I wasn’t posting was because something bad must have happened. I know they all were just showing how much they cared and we of course appreciated whenever someone would want to check on us but really I just got tired of writing “waiting for Liam to put on more weight” over and over and over again. It was when I realized that I should be careful about making this the family’s only outlet for relaying Liam related information. 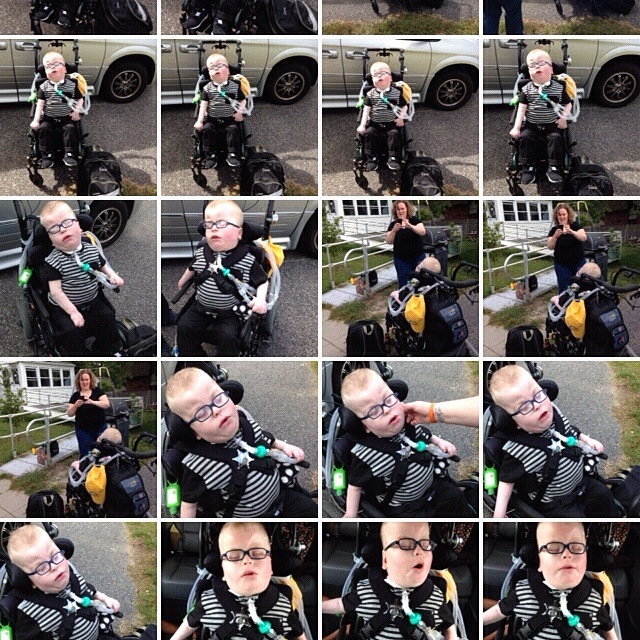 The stress and responsibility of keeping everyone up to date with every little thing wasn’t a precedent I was confident I could keep up long-term and so I stopped using blogging to describe the day-to-day details of Liam’s medical needs or problems. Even though I actually post more and go into greater detail during hospital stays and times of great stress, this blog is not a blow-by-blow account of every little medical thing that Liam encounters but more of an episodic narrative about the attitude and hopeful positivity of Liam’s, and by extension our family’s, life overall. But whether I liked that aspect of it or not, just like that Carepage, this is a great way to get information out to family and friends all over the country and I should try to find a happy medium in using in that way with more updates on the goings on here in The Olsonshire. I’ve been asked by enough acquaintances and co-workers the same bunch of questions lately and I figured that many of you, my family and friends, might be wondering some of these same things, so I put together a list and this way I won’t have to make a whole bunch of phone calls. It’s like a FAQ for Liam’s life right now. Why it’s going freaking awesome thank you very much. We are still trying three different walkers to see what works best for Liam but we are having a blast watching him put in so much effort. He is truly an inspiration to all that see how much effort and determination he puts into everything we ask him to do. Unfortunately walkers are not cheap and even once we find one we like it probably be purchased by the school and kept there for him (and any future students with muscle tone issues like Liam’s) to use during his school day. It’s not an ideal situation of course, we would love to have a walker for him at home, but walkers don’t grow on trees. What about school? Almost finished? School is great but yesterday was Liam’s last day. Luckily our school district has an extended school year summer program so Liam will go back to school in a few weeks so we can try to keep up with all of the progress we’ve made in his physical therapy. Karin also got Liam enrolled in some supplemental therapies at an outpatient facility to stave off any regression. Oh the Van is more incredible than I ever could have imagined. How else would Karin have been able to bring Liam to surprise me at work on Father’s Day? We are still getting acclimated to the true freedom, safety and convenience that the van allows and so I still get excited and happy getting Liam in and out of it. And after any benefits to Liam and the costs incurred by his medical needs, the long-term goal of the Liam the Lion Fund has always been to continually raise funds to donate to our local children’s hospital and any other special needs charities that we decide on. That’s the goal at least, but we are a long way from there. There will still be Liam the Lion Fund bracelets. There will still be pasta dinners and art auctions, hopefully sometime soon there will be a website and other opportunities so stay tuned. Thank you to all of the friends and family who have donated. We wouldn’t have made it this far without you. Ok, well none of us like talking about money. How about all these adorable pictures! You have been taking such wonderful photos of that kid! Well thank you and yes, yes they are wonderful photos but I didn’t take a single one of them. Karin has been killing it with the cell phone camera lately and these are the kind of thing that I get sent to me at work every day to brighten my day. Well except for this nighttime pic which I was present for when she took it. It’s a picture of true peace and relaxation. That glowworm (it’s actually an off-brand glo-seahorse) has been with Liam in his bed since the NICU but we haven’t turned it on in a couple of years. He actually seemed like he remembered it. So there you go. School has ended, Liam loves using a walker, the van is still awesome though as of yet remains unnamed, and we continue to need money (don’t we all). Now you are all caught up. I’ll try to do this more often.